Look. 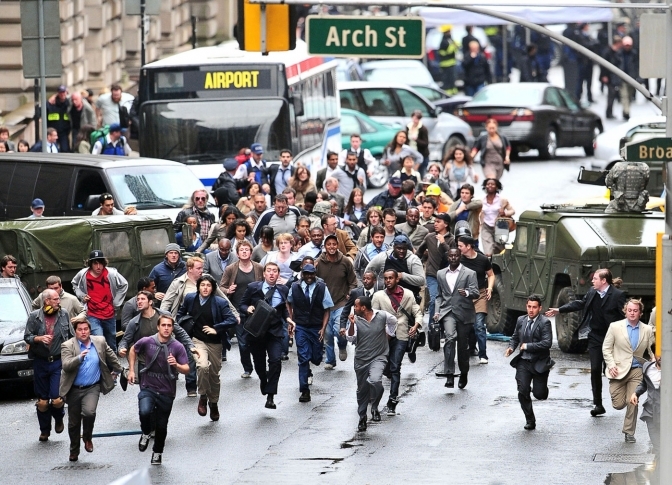 On most every other blog right now you can find an article about World War Z. Not only is it a huge blockbuster that just came out, did well enough to merit a greenlit sequel and stars Brad Pitt, it’s also based on a beloved book that it has virtually nothing in common with. Everyone is talking about it. Everyone. I mean we literally just did a Crossover Appeal on it. But I want to talk about the one thing people seem to not be talking about right now. The movie itself. I don’t mean the movie in relation to the book, or the movie in relation to other zombie movies. Even the movie as it relates to other outbreak or contagion movies. 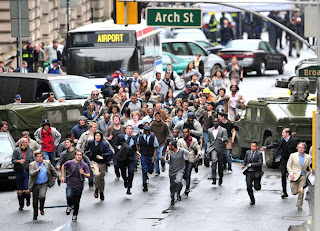 I want to talk about World War Z the movie. That’s it. It was intense, in an adrenaline pumping “holy crap I am never sleeping again” kind of way, while still remaining intellectually engaging. The action was varied and imbued with enough emotion that I was never bored, and the whole thing did a good job balancing the global stakes alongside the personal ones. Various socio-political issues were teased out, and the ending was left blissfully ambiguous. Cynical people might suggest that this was to provide room for a sequel, which is true, but it also fits the tone of the film overall. In general, it’s just good and I think you should watch it if you have anything resembling a strong stomach. But, as always, let’s break it down. The movie, as mentioned before, is nominally based on Max Brooks’ book by the same name. 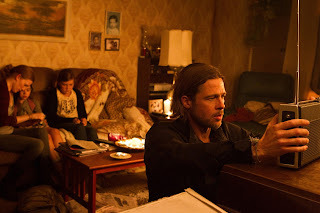 While that book is a multi-narrative oral history a la Studs Terkel’s war writings, the film follows one protagonist, Brad Pitt’s Gerry. Gerry is a retired UN investigator (or as one review memorably called him, the UN’s ninja), who finds himself running for his life when the zombie apocalypse comes. Gerry and his wife, Karin, who was played fabulously by Mireille Enos (who really needs to get more roles than just “saintly wife”), are trapped in Philadelphia when the apocalypse starts, and have to struggle to get themselves and their two daughters out. The stakes are incredibly high, and when they do get out, having gained another child along the way, you feel their relief and joy to be taken to an aircraft carrier where they’re safe. Of course this isn’t the end of the story. Since Gerry is a UN ninja, and they have to figure out how to stop the zombies, Gerry is given a choice. He can go out and try to find out how this whole mess started or he and his family can leave the safety of the aircraft carrier. Obviously this is not much of a choice. And so our story goes. Gerry and a group of soldiers accompany a doctor who wants to figure out the disease, traveling all the way to an army base in Korea that seems to have been the start. Except it wasn’t, and all the soldiers and the doctor die while they’re there. 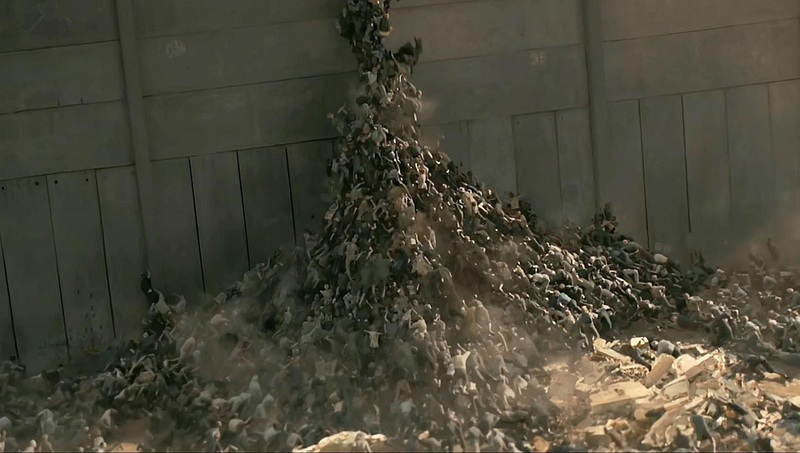 Then they go to Jerusalem, which is miraculously not overrun with zombies, only to see it become overrun with zombies, and our hero has to escape, etc. 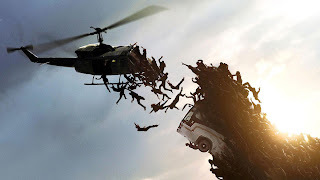 It’s very action film, with lots of overseas locations, action set pieces, and lots of zombies, but there’s something else lingering there, in the background of each scene. Again, try to think of this as just a movie, and not as a movie based on a beloved (but very different) book. While it’s certainly been Hollywood-ized in some respects, like with Gerry’s uncanny ability to not die, World War Z is hands down the most intriguing and potentially realistic zombie movie I have ever seen. And it’s just plain good to boot. What makes the story feel real isn’t the action, the plot, or even the really brilliant political stuff (which is brilliant). It’s the characters. I feel like I end up saying this all the freaking time, but I don’t care. Characters make or break a story. Characters make or break a story. Characters make or break a story! While Gerry isn’t the most interesting guy in the world, what with him being an upper-middle class white dude with ninja skills, he’s at least relatable. You really like him, and when he finds himself in trouble, you feel worried. Brad Pitt’s a great actor, and the moment when you most love his character is actually completely in the character work. Gerry’s trying to sneak silently past some zombies when his phone rings, because Karin is trying to call him on satellite phone. Naturally the zombies attack and it’s brutal and very tense, but later on, when he reaches her, Gerry doesn’t castigate her or complain, he just sighs and says it wasn’t a good time. That’s an interesting character. Or at the very least, a likable one. The other characters are pretty cool too. While some seem to be very disposable (I respect the film’s willingness to murder its characters), others stick around, and those that do are intriguing, no matter how much screentime they get. Like I said, Mireille Enos is amazing as Karin. Worried but holding it together for her kids. Fighting for their place in a world of dwindling resources. And quietly raging when the fight turns sour. Or take Segen. Segen (just the one name, and how cool is that?) is an Israeli soldier that Gerry manages to get out of Jerusalem when the city falls. She’s young, trigger-happy, and missing a hand that Gerry had to cut off to stop infection, but she’s also quiet, contemplative, and incredibly competent. Segen barely gets two minutes to make us love her, and she does, purely by the way she screams when Gerry cuts off her hand, but gets up and keeps running afterwards. And we can’t forget the WHO doctor, played by Ruth Negga, who helps Gerry navigate the zombie infested WHO headquarters looking for a way to incapacitate the zombies. A woman whose entire office was infected, had to help block off half the building, and then stuck around to try to find a cure. Love her. I could keep illuminating the characters I loved in this film, but I don’t want to obscure the larger point. Namely, characters make the story. 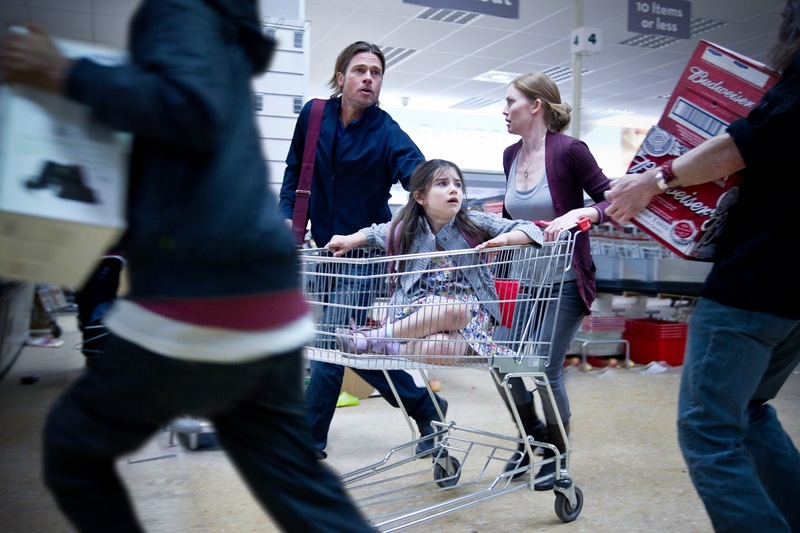 World War Z is a good movie because it has good characters. The story, when you strip away the really great special effects and the gorgeous locations, is actually pretty simple. The reason it works, the only reason it works, is because we’re emotionally invested in it. And the only reason we’re emotionally invested in it is because the characters are good. So go watch it, dammit. And stop complaining about how it’s different than the book. Different doesn’t mean bad. It just means different. Oh, and one final thing. The socio-political stuff? Is well written and genuinely touching. While some people complain that there isn’t enough of it, what there is is beautifully done. It broke my heart to see the scenes in Israel, where the government took precautions against the plague and now use Jerusalem as a place of refuge for those escaping. Watching Muslims, Jews, and Christians singing and dancing as they got let into the holy city, and then watching zombies tear them apart? I cried. Because sometimes it seems that the only time we manage to overcome our differences is right before they cease to make any difference at all.